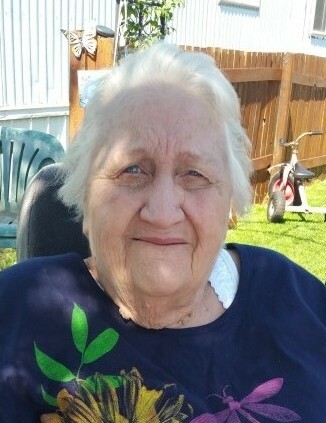 Sharon Elizabeth Lavalier, age 77, of Detroit Lakes, MN, passed away on Sunday, February 10, 2019, at her home. Sharon was born on May 14, 1941, to Arthur and Gladys (Hanson) Fredrickson in Ryder, ND. She was raised in the Moorhead area before moving at a young age to Detroit Lakes, MN. On October 29, 1959, Sharon was united in marriage to Robert Smith to this union three children were born: Brenda, Beverly and Robert. On March 21, 1966, she married Raymond DeWitt and to this union DeeDee and Dwain were born. Sharon held various jobs throughout her life; she worked at Lakes Hotel, Corner Bar in Vergas, The Treehouse in Detroit Lakes, and cleaned cabins in the area. After marrying Wayne Lavalier on October 4, 1980, they owned Lavalier Woodworks making planters and children’s furniture and worked at Lampert’s, where Sharon and Wayne built sheds. Sharon’s main focus in life was her family. She loved to spend time with her children and grandchildren. She also opened her home to anyone needing a place to stay. She never turned anyone away, her door was always open. Her kindness and generosity will be missed by many. Sharon is survived by her children: Brenda Sharbono of Detroit Lakes; Robert (Carlene) Smith of Twin Valley; Beverly DeeDon of Joplin, MO; Dwain (Betty Buck) Dewitt of Detroit Lakes; DeeDee (Bill) Carlson of Detroit Lakes; 9 grandchildren; 15 great grandchildren; 6 great-great grandchildren; and numerous nephews and nieces. She is preceded in death by her parents: Arthur and Gladys; brothers: Darold and Gerald Fredrickson; husband, Wayne and great-great grandson, Kayden Rose. Memorial service will be held at David-Donehower Funeral Home on Friday, February 15, at 2:00 pm. Visitation will start two hours prior to the memorial service.